This photo was taken on November 23, 2012 at 12:24pm. The "Take It!" started out as a tribute of sorts to those 'Star Wars' fans that are just as enamored today as I was when this movie first played in the movie theaters. It is another photo of what is an ongoing facination with what people will stick on the back of their car as a message to others. This was the first time I had seen this take off on the costuming of the family decal. I thought it was cool - so grabbed this shot. Little did I know the reflections off the rear window on the vehicle would capture so many reflections including a bit of shadow of myself. I think there is even some of the stuff that is inside the car that shows up as well. Sometimes we get far more than we bargained for - lol. The After Take: Everyone that I showed the shot to seemed to enjoy the novelty of it. Beyond that, not much was said. My own little story on this movie cames from when this movie first was shown in movie theaters. It has been a long time ago. I was living in San Francisco and had a friend that had part ownership in a movie theater in the city. In advance of the first showing he said that he wondered if they had invested wisely in a new and until then unproven sound system that they had installed in the theater just for this particular movie. He said I would just have to come and see the movie for myself and let him know what I thought. The movie opened after a huge ad campaign and was a complete knock out. The sound system was 'Dolby' and of course helped in a huge way to make the movie. The theater showed the same movie for 2 years straight as the only feature and sold out for almost every show way into the second year. The theater itself became a part of what the huge fan base admired. Needless to say my friend was most happy with his vote to go ahead with the investment in the sound system. We will include more of what we see on the back of vehicles under this new label as time moves us forward. I do not think there is any chance of us running out of new material. Here is hoping you have also encountered some humorous or interesting messages on the rear of cars be they in traffic (try to keep your distance when reading them if they have fine print - lol) or parked where one can look at them at their leisure and maybe even take a photo of them. Thanks for joining us for the current photo presentation. You are cordially invited to return Friday, February 1st for a new picture that we hope you will enjoy. My husband would have loved this, its too bad our kids are adults and have long since moved. That is soooooooo funny. 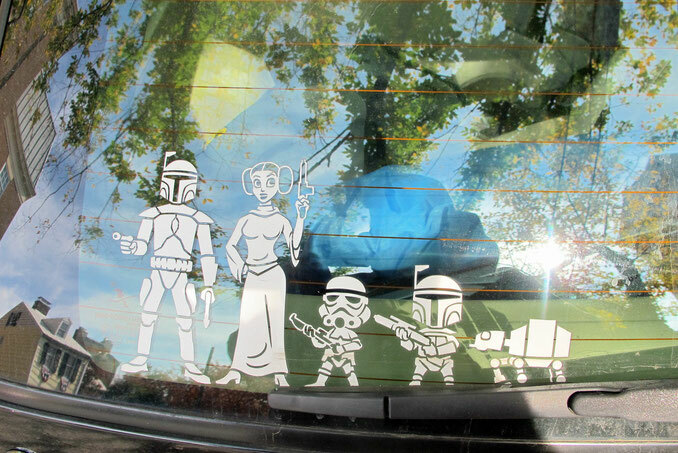 I need to find out where I can get a set of these for my minivan. Always fun to stroll back onto this site after awhile and be greeted by a photo like this one. I am not a huge star wars fan but this is a fun idea. By the way, I love the changes to the site.